Elisabeth Elliot wrote that a clam glorifies God better than we do because the clam is doing what it was created to do, and we are not. 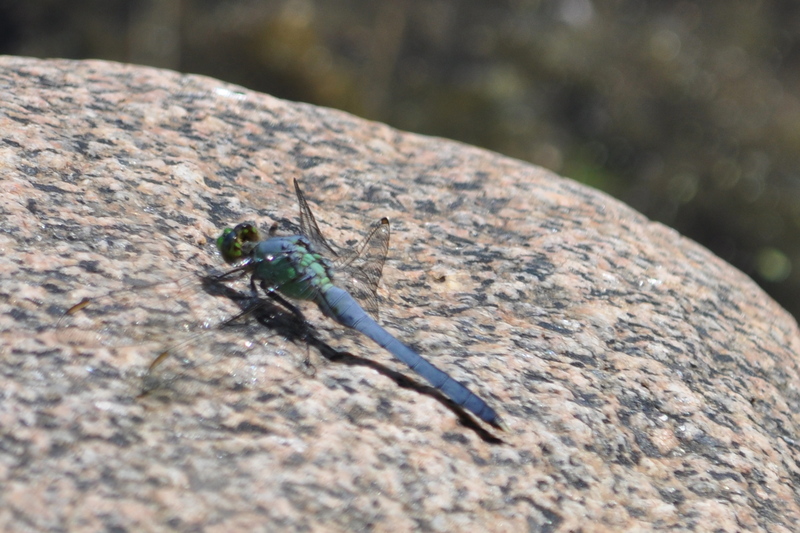 I thought of that quote when I saw this picture I took of a dragonfly, basking in the sunlight–just as we were meant to rejoice in the presence of God. Moses has been experiencing the presence of God, though, in some incredible ways. God’s presence was a visible cloud by day and a fire by night. Moses went into the tent of meeting, and the Lord spoke with him there “face to face, as one speaks to a friend.” Moses has gotten a taste of God in His reality, and he doesn’t want to give it up. Moses refused to live without the presence of God in his everyday life. That sentence has stuck in my mind for months, and I’ve wondered what it would be like to walk through my days in the presence of God. I immediately thought of Moses’ protest. Moses experienced just a taste of God’s presence, and he couldn’t live without it. In fact, it made him want more. Further on in Exodus 33, he begs to see God’s glory, and God reminds him that while he is in his earthly, death-bound body, he can’t see all of it. But God covers him with His hand and passes behind him and still, despite the “protection,” Moses’ face shines so much the Israelites are afraid of him. Christ, as God Himself, and as a human in complete fellowship with God the Father, had experienced far more than Moses. He knew the fullness of God’s bright presence, and “life” without it was a “horror.” No independence (like that offered to Christ by Satan during His temptation) was worth that horror. Yet we live with this horror every day. We chose this horror in the garden, when humanity turned away from the presence of God and sought independence from His presence. We’ve been doing the same ever since, and the longing for and joy we were meant to experience in God’s presence has been turned to fear and hiding and even loathing. You might say we were given what we asked for. Through Christ we can long for God again. We can understand that our deepest desperation is not a need for independence or personal significance but is in actuality a desire for the living Presence of God. And through Christ we have the opportunity to enter that Presence. Amen!! Just reading this morning how Gid delights over us and absolutely nothing can separate us from His love. In His Presence – no better place!